Lady and the Blog → Living → Please Vote For My Hillshire Farm Sandwich: Snag A Free Coupon And Help Me Donate 5K To The Boys & Girls Club! Please Vote For My Hillshire Farm Sandwich: Snag A Free Coupon And Help Me Donate 5K To The Boys & Girls Club! Party People!! 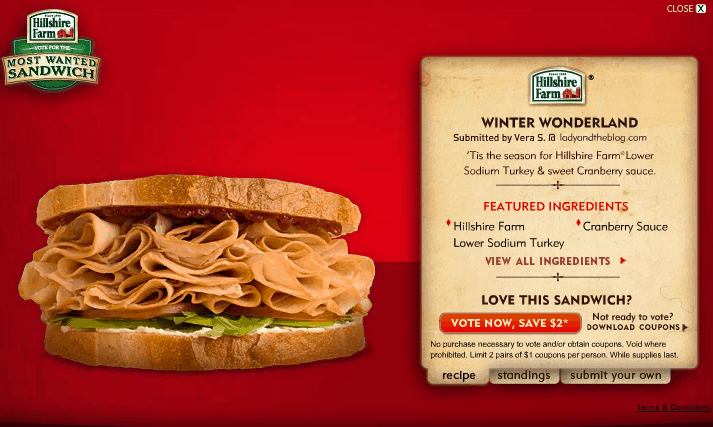 I was chosen as one of the finalists in Hillshire Farms’ Most Wanted Sandwich contest! I’m up against a dozen bloggers who each have a chance to donate $5K to a charity of their choice AND to get $5K of their own . If you vote for my ‘Winter Wonderland’ sandwich you will be helping me giver $5K to the Boys and Girls Club of America – my charity choice. I’ve been working with that organization for YEARS and would love the opportunity to give them this prize. So, what sandwich did I submit for Hillshire Farms’ Most Wanted Sandwich Competition? It’s a healthy one! Turkey, cranberry sauce, crisp apples, cream cheese and baby arugula. YUM! Click here to get started! My sandwich is called ‘Winter Wonderland‘. Would really love the support!!! Plus you can snag yourself a $2 off coupon just for voting! You can come back once a day to vote (if you’re so inclined). Go meat! !